Having known nothing about The Killing of the Sacred Deer before entering the theater, I will suggest others do the same. What I will tell you is that the film stars Colin Farrell and Nicole Kidman as parents and doctors. They have two children (Raffey Cassidy and Sunny Suljic). Farrell’s Steven meets a child named Martin (Barry Keoghan) at a diner, where they talk about fries. That’s all you get. You’ll just have to take it on faith that this is a film with a narrative worth sticking around for. And you will have to stick around, as this is as deliberate as the very deliberate filmmaker Yorgos Lanthimos can make it. I don’t know for sure whether it is clever screenwriting or clever pacing, but this film uncoils with a dreadfully creeping presence that keeps narrative beats under wraps until it is far too late to see what is coming. It is not the most twisty of stories, but Lanthimos’ penchant for stilted delivery keeps character motivations a giant question mark until the fan is struck with the proverbial scatological catastrophe. For once, this stilted dialogue feels out of place in a Lanthimos film. Eventually, you become attuned to it, but it takes longer to acclimate to it here than in, say, The Lobster, where the world seems alien enough to allow for such blunt statements. 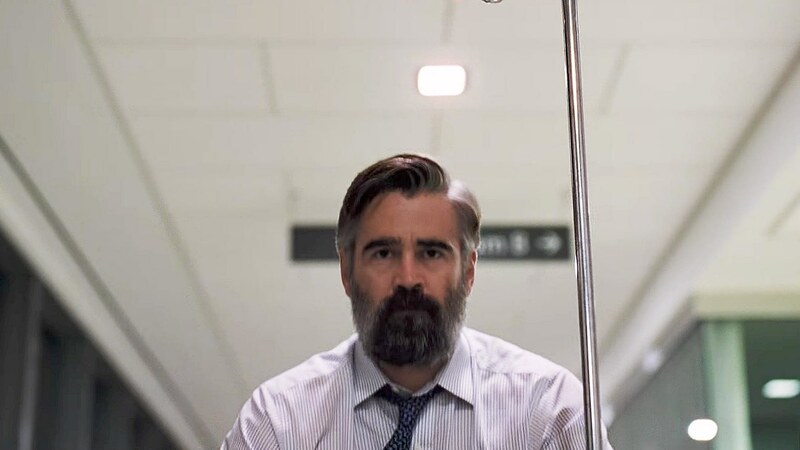 In The Killing of a Sacred Deer, the world is broader and more real-to-life, which makes the dialogue a harder pill to swallow in the diegetic world we are given. Still, the writing from Lanthimos and partner Efthymis Filippou is elegantly simple yet affecting. There isn’t the sharp wit found in The Lobster, but that is because the morbid comedy of these writers is nowhere to be found in The Killing of a Sacred Deer. Awkward laughter may accompany moments, but they are not humorous in the bleak and dire ways that moments play out in other Lanthimos films. Sure, there are what feel like loose ends in the script. There are small motifs like cigarettes and potatoes where I cannot seem to put a finger on why they keep cycling back into the dialogue. They may just be idiosyncratic additions to the characters, like the compatibility tics of characters in The Lobster. Or perhaps they hold more thematic pertinence than I give the screenwriters credit. Either way, these little recurring pieces come off more distracting than they do illuminating. At the center of this film is a brutally unnerving performance from a young actor. Farrell easily slips back into his persona from The Lobster, pulling out another interesting performance. Kidman is all the more riveting as Farrell’s wife, in that her character sneaks into the forefront in a way that is entrancing. But it is Keoghan who controls the film, which would not succeed without his sly menace. The Killing of a Sacred Deer may not be as pleasing as The Lobster or Alps. Those films are cheery and whimsical in relation. But Lanthimos’ latest is a rich aesthetic tapestry that is transfixing. The pure control of form that he has achieved in this piece is fascinating. While the tone has shifted to a more pure nihilism, Lanthimos’ grasp of formalism has grown immensely. The film is steady and controlled. Pretty much every shot is accompanied by a slow track in or out, which makes even the most innocent of images, like two teens sitting under a tree while one of them sings a pop song, read as foreboding and eerie. The score of the film is introduced gloriously in the first moments of the film, over a black screen, then mostly disappears for a time. When it comes back into the fray, the music creeps up like the film’s sinister plot does, continuing to build in suspense and volume until it all but dominates the soundscape. Production design is sparse but immaculate. A hospital set is large and sterilized, mostly empty, isolating. The family’s house, in comparison to another character’s home, is consuming in its massiveness. It is hard to favor The Killing of a Sacred Deer over other Lanthimos films. But this almost proves that the film is Lanthimos’ most effective work. I am much more likely to return to Dogtooth or Alps before this film, yet Sacred Deer has already sunk its claws into me. It is unrelenting, consistent, and wholly unexpected. Can’t wait to see this. Great cast. Excellent review thanks. This absurdist arthouse film is tantalisingly ambiguous; most viewers will not be sure if they are watching a supernatural horror, a psychological thriller, or a black comedy. Thats its greatest strenght. This sounds like something I’d love, I must watch it. Great review, and thanks for not spoiling it one bit!